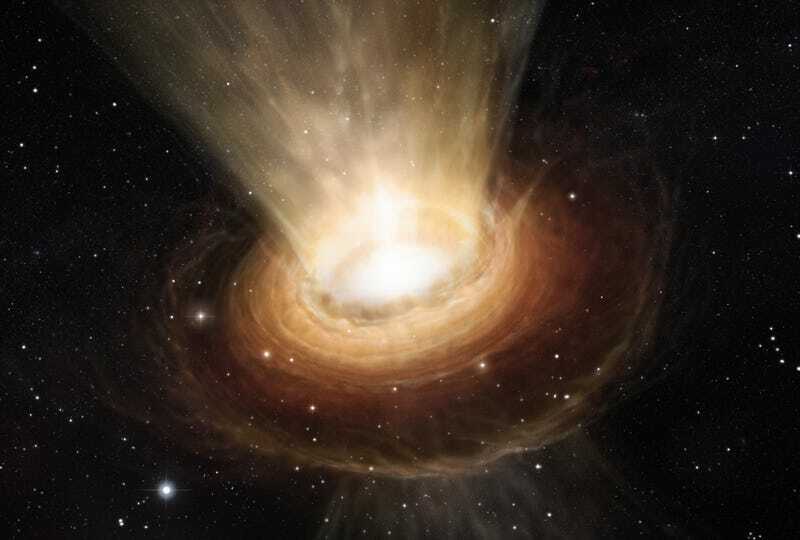 Information can escape the clutches of a black hole, say researchers from Buffalo University. And incredibly, they say this information is not just gobbledygook — it can actually be deciphered to show what lies beneath. This could have a major impact on the ongoing debate among physicists as to whether black holes destroy information or if some manages to escape. Back in 1974, Stephen Hawking rocked the physics community when he suggested that black holes surrounded by quantum fields are capable of radiating particles — so-called Hawking radiation — and that this process causes black holes to whither away and evaporate. His hypothesis inevitably gave rise to what's known as the "Black Hole Information Paradox," a problem that's been plaguing physicists ever since. Hawking's idea would seem to imply that information inside a black hole is permanently destroyed after it disappears — an apparent violation of quantum mechanics, which states that information is never truly lost, and that the initial state of a system can always be determined. In the years following, some physicists — Hawking included — adjusted their thoughts and agreed that information was not irrevocably lost within black holes. But they struggled to come up with the requisite math to show how this was possible, or convey how this information could be recovered. What's more, many of them didn't believe the information was even useful. Now, a new paper by physicist Dejan Stojkovic of the University of Buffalo, along with co-author and UB PhD student Anshul Saini, may finally correct this shortcoming. The key, says Stojkovic and Saini, is to look at more than just the particles that are bleeding out from a black hole — it's important to look at the way the particles interact. By finding the subtle ways in which particles influence each other, the researchers say it may be possible to understand what lies within a particular black hole. Such interactions can include gravitational attraction and the exchange of mediators like photons between particles. Interestingly, physicists are familiar with these "correlations," but they tend to be discounted as being unimportant. The researchers say these interactions could reveal information about the inner features of a black hole, including the characteristics and/or nature of the object that formed the black hole itself, along with the characteristics of the matter and energy pulled inside. If they're right, the trick now will be to collect and decode the relevant information to make sense of it. That will likely prove to be a monumental task. Read the entire study at Physical Review Letters: “Radiation from a Collapsing Object is Manifestly Unitary”. It's also available at the pre-print arXiv. Image: Artist's impression of a supermassive blackhole at the heart of the active galaxy NGC 3783 (ESO/M. Kornmesser).